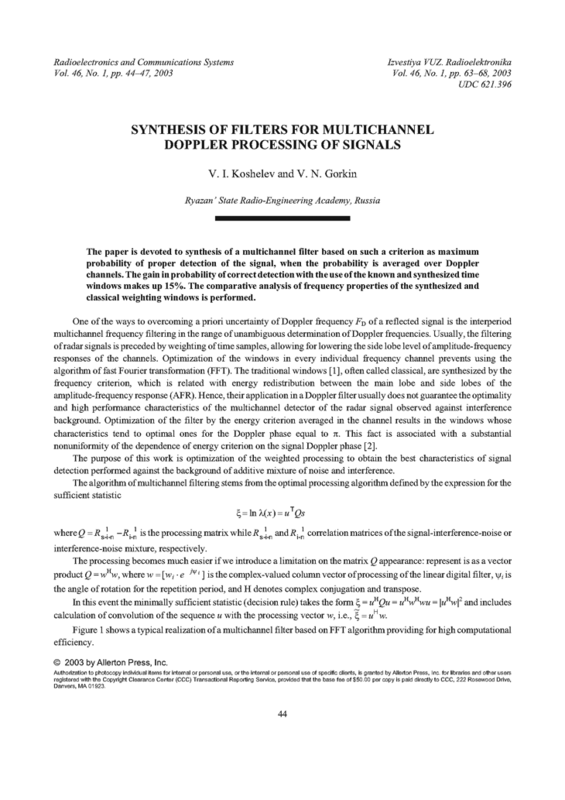 The paper is devoted to synthesis of a multichannel filter based on such a criterion as maximum probability of proper detection of the signal, when the probability is averaged over Doppler channels. The gain in probability of correct detection with the use of the known and synthesized time windows makes up 15%. The comparative analysis of frequency properties of the synthesized and classical weighting windows is performed. HARRIS, F.J. "On the use of windows for harmonic analysis with the discrete Fourier transform," Proc. IEEE, v.66, n.1, p.60-96, 1978. DOI: https://doi.org/10.1109/PROC.1978.10837. POPOV, D.I. ; KOSHELEV, V.I. "Sintez sistem kogerentno-vesovoi obrabotki signalov na fone korrelirovannykh pomekh," Radiotekhnika i Elektronika, v.29, n.4, p.789-792, 1984. POPOV, D.I. ; GUS’KOV, S.V. ; KOSHELEV, V.I. "Sintez sistem adaptivnoi obrabotki po veroiatnostnym kriteriiam," Radiotekhnika, n.6, p.9-12, 1985. BELLMAN, R. Introduction to Matrix Analysis, 2nd ed. SIAM, 1997.